Even though some of us Toronto Maple Leafs fans know better than to get excited about a play off season, it IS possible at this point in time that the Leafs and Habs could face off in the play offs.... so let's see how Montreal and Toronto face off when it comes to bike infrastructure. Guest post from Robert Zaichkowski originally published on February 20, 2017 on his blog Two Wheeled Politics. 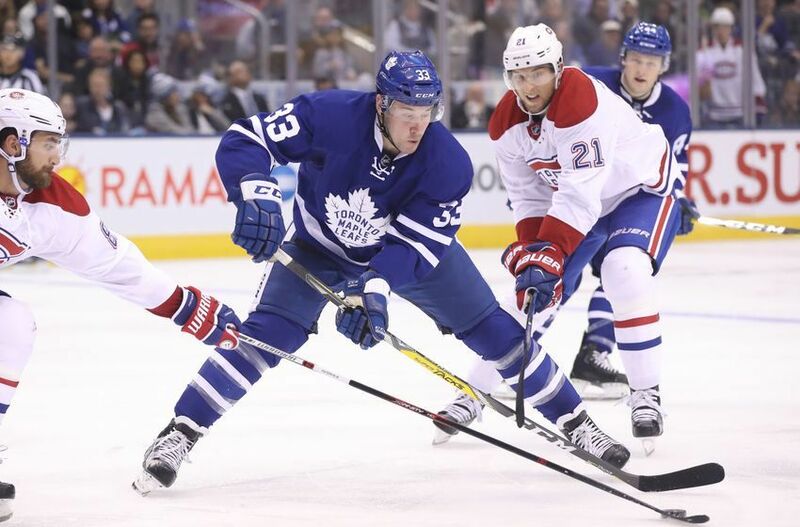 One of the oldest and largest Canadian sports rivalries is the Montréal Canadiens (Habs) versus the Toronto Maple Leafs. 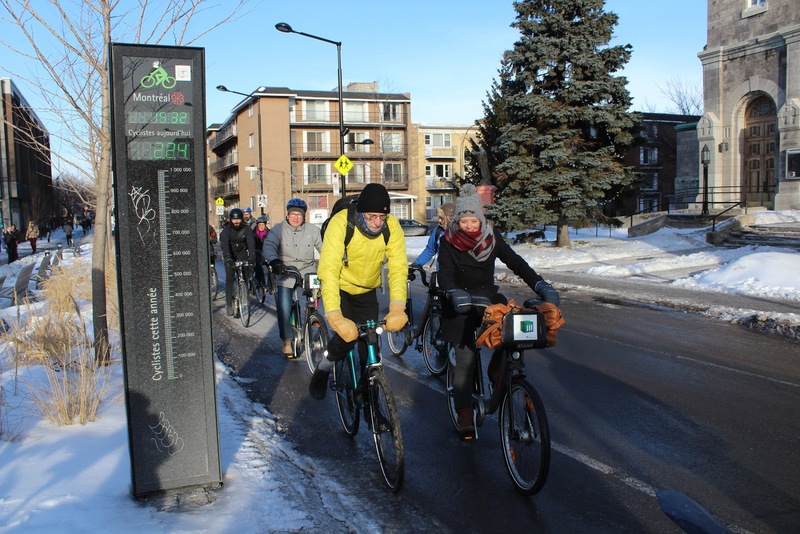 Until last week’s Winter Cycling Congress (see previous post), I never biked in Montréal which Copenhagenize and Biking Expert ranked as among North America's best. After getting a taste of Montréal’s infrastructure, let’s review their facilities and see how Toronto stacks up. Bartek Komorowski’s mobile workshop about Montréal’s four seasons cycling network was an eight-kilometre ride from Bibliothèque le Prévost (near Jean-Talon Métro station) to the Hyatt Regency Montréal (Places des Arts station). Before starting our trip, we saw a snow removal machine with a brush in front and a liquid brine dispenser in the back. Brine is a salt water solution which is more expensive, but less corrosive than road salt. Komorowski mentioned the responsibility for winter maintenance lies with individual boroughs (e.g. Plateau-Mont-Royal), given a neighbouring borough used road salt. There is a guide currently being developed to harmonize maintenance standards. Snow removal in the bike lane! Our ride started on Boyer Street; one of the first cycle tracks which opened in 1984. These older cycle tracks are bi-directional and use paint and green bollards. Until this past winter, it was among many which were closed from November 16 to March 31. Given the popularity of Boyer Street for cyclists – about 8000 to 9000 use the cycle tracks daily – it became the first to have traffic signals synchronized for cyclists last year. Montréal was the first city where I saw a bike counter display up close; located at Laurier station. That street has a contraflow bike lane where bicycles outnumber cars at about 4000 cyclists per day. Wide sidewalks are also provided to improve safety for children getting to the nearby school. While the Boyer cycle track and Laurier contraflow bike lanes were properly maintained, Komorowski ensured our workshop included examples of poor cycling conditions. Case in point, the contraflow bike lane on Laval Avenue was almost invisible. Not only were there parked cars on both sides – creating a dooring risk – but the freezing rain, thaw, and subsequent flash freeze turned that road into a skating rink! Since the BIXI bikes didn’t have winter tires, I had to steer into a snowbank to avoid injury! We then used cycle tracks on Rachel, Berri, and Maisonneuve Streets to return to the Hyatt Regency. The Rachel cycle tracks were recently retrofitted with raised tracks and barrier curbs, while those on Maisonneuve near Place des Arts are sidewalk based. The Berri and Maisonneuve intersection is a potential challenge, given cycle tracks on both streets are amongst the city’s most popular. Per the counter data from the Ville de Montréal’s website (more on data collection in this post), Berri averages 3900 cyclists per day from May to September (7500 peak) and Maisonneuve averages 5700 per day (9400 peak). For comparison, Toronto’s Bloor Street and Queens Quay peaked at 6000 cyclists per day. For future reconstruction – including upcoming work on Rosemont Boulevard – Montréal is shifting to unidirectional cycle tracks. Of its 788-kilometre bikeway network, Montréal currently clears 432 kilometres or 55%; putting Toronto to shame given they only clear the Martin Goodman Trail and streets with over 2000 cyclists per day. This effectively means nothing for Toronto cyclists west of Ossington Avenue, north of Bloor Street, and east of the Don River. Despite Toronto’s cycling network and winter clearing being dwarfed by Montréal, there are a few things Toronto does better than Montréal. Year-round bike share! – BIXI Montréal is larger than Bike Share Toronto (5200 bikes vs 2000). However, Montréal’s BIXI stations and bikes are removed and stored during the winter months, while Toronto’s is open year-round. A Winter Cycling Congress presentation mentioned it was cheaper for Toronto to maintain its bike share during the winter than removal and storage. More accessible subway stations! – Elevators are key for encouraging people to bring bicycles on subways. Right now, only 10 of 68 Métro stations have elevators compared to 35 of 69 TTC stations. While Toronto plans to make their entire subway network accessible by 2025, Montréal must wait until 2038 with only 31 stations accessible by 2022. Furthermore, Montréal only allows people to bring bicycles onto the first subway car; something not required by Toronto. No winter closures! 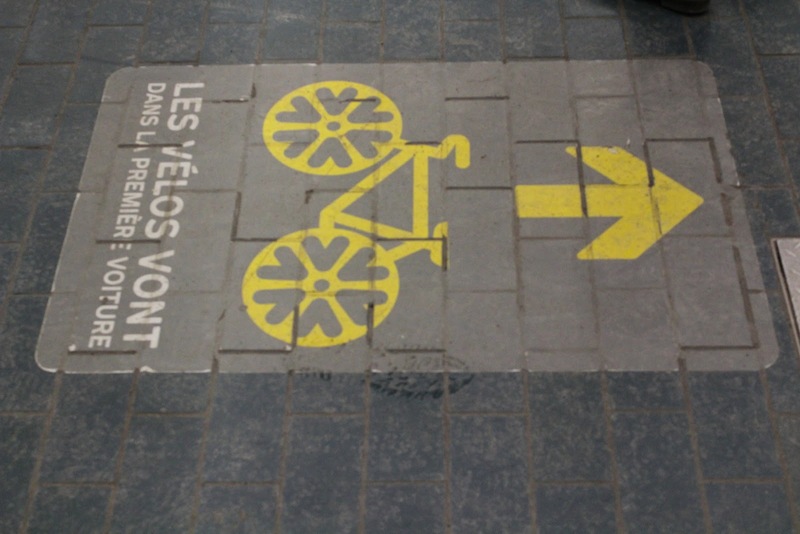 – While many of Montréal’s cycle tracks are closed for the winter months (until next winter), Toronto never had this rule despite inferior winter maintenance. It may appear Toronto does not fare so bad after considering advantages such as winter bike share use and accessible subway stations. 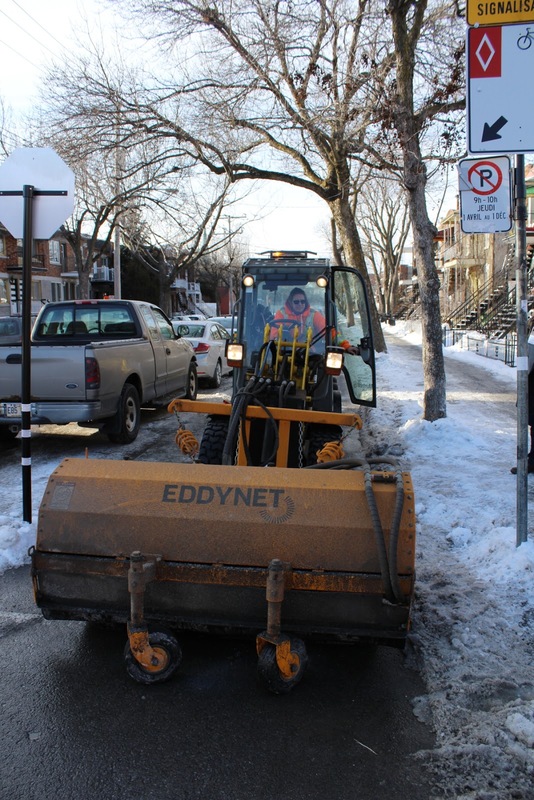 However, Toronto must accelerate their cycling network plan – which was dealt a recent setback by deferring bike lanes on Yonge Street – and improve their winter maintenance program by reducing salt use and expanding snow clearing. One last Montréal idea Toronto may want to adopt to fix bicycle parking shortages is to retrofit existing poles with bike rings. Thanks to Bartek Komorowski for showcasing Montréal’s cycling facilities and providing supplementary information. Let’s continue moving Toronto forward and get a true bike rivalry going!